I know I'm killing you with my nautical colours but lately I can't help it and this light jacket with those cute clollar pleats , I promise gonna post more stuff soon those bright colors and maxi skirts been killing me lately ! Im loving the jacket,are doing shoping at miss selfridge in kuwait cuz i dont see good things like that one ? Love the gorgeous pleated neck detail. Am new here and I love your blog. 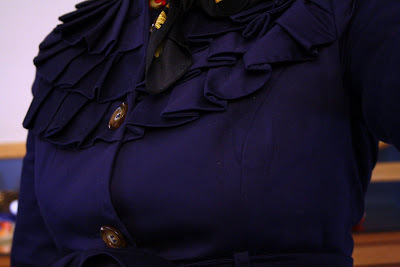 Love your ruffled neck detail.